Indigenous equines is inclined to receive every beck and call. For an obedient horse is an unsafe fellow, I frankly foretell. Wisdom is to not throw away what we want not be without. Every well-broke steed may break, but genuine trust bows by the breeze. 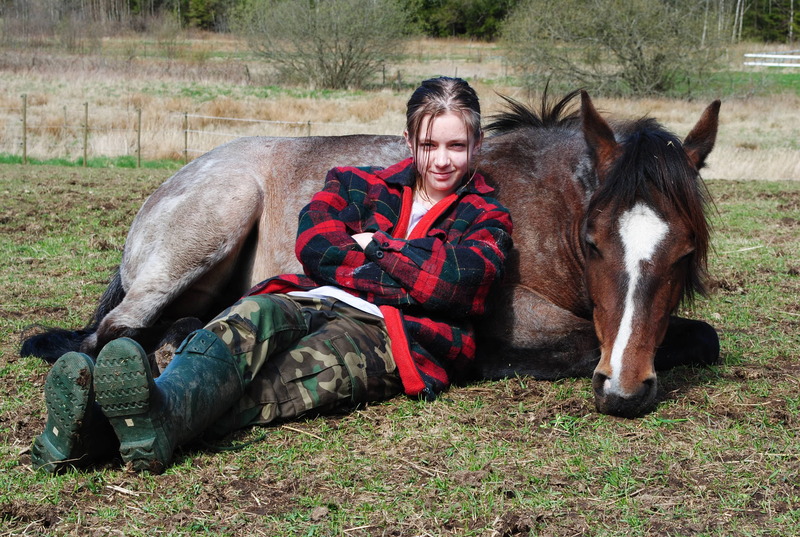 Rest calmly in Windflowers arms; sweet daughter and filly, bonded by trust. The third day’s assignment was prompted “trust” in the “acrostic” form and device “internal rhyme”. This entry was posted in Horsemanship, Poetry and tagged horse, photography, poetry, writing201. Bookmark the permalink. Lovely. I have a fear of horses. Can’t tell why but I do. Thanks, it’s wise of you. Horses are big, strong and easily scared. Some horses have preconceptions due to bad (or good) experiences, some horses are hot some are quiet, just like people. That picture is indeed a treasure as @billgncs said and the work clearly shows your devotion to your relationship with the equines. A very good work indeed. I’m glad you think so, thank you very much!